Texas never had a ton of cloverleafs or loop ramps. In 1991 when TxDot was created a directive was given out to remove cloverleafs and loop ramps, and to not build them in the future. I am not sure if this is codified anywhere, it's just sort of general knowledge. I've asked them before for some policy document or what have you, but their Public Information Office is generally worthless (sorry). I believe US 75 at Loop 12 is still a partial cloverleaf. yeah, it is - so I said "loop ramps" instead of "cloverleaf" ! Things get done without necessarily being explicitly supported by a codified policy, so I have no trouble believing TxDOT is getting rid of loop ramps--it would just be nice to have a document that spells it out in black and white. The impression I receive is that TxDOT operates on the basis that any freeway-to-freeway interchange is a platform for future construction of a four-level stack on the Maltese cross plan. As a result, Texas has very few examples of interchange types which are common in other states, such as turbans (just one--defective--example in Amarillo at the I-40/I-27 interchange) or directional interchanges (a few in Houston, including one on I-610 where the ramps and mainlines are perversely laid out similarly to a Maltese cross stack). Everything is vastly outnumbered by stacks, of which Texas has almost as many as the rest of the US combined. Also, a very standard way of working for TxDOT is to build upgrades to existing interchanges which provide direct connectors for traffic which is being served by loop ramps or frontage road intersections. These projects go forward whether the interchange as a whole is being converted to a stack or not, and invariably the resulting direct connector is laid out so as to leave room for the other DCs which would be required for a complete stack. I-35/Loop 20 in Laredo is a case in point, as is I-35/SH 45 (toll) north of Austin. I have no idea what a turban interchange is, is it related to a Catherine Wheel? I'm not sure why there is such a pro-stack policy here, but it probably has to do with outdoing something another state did in the 50s. A turban (or turbine, as they are occasionally called in the literature) has left-turning ramps which wrap around the center of the interchange like swaddling around a head or vanes around an armature. In contradistinction, the left-turning DCs in a stack "cut the corner" and avoid the center. I-135/US 54 in Wichita is a classic example of a three-level turban. I-40/I-27 in Amarillo would be a classic two-level turban except that one of the SB merges is to the frontage road rather than the mainline. Where stacks are concerned, Texas pounded California into the ground long ago--the scorecard is 9 versus (more than?) 25. I think the relatively generous provision of stacks in Texas has more to do with how the real estate business operates there. Quite a few suburban freeways were built on land donated by developers, and I-10 west of Houston is said to be the first freeway in the US to have had ten lanes as the original construction. Meanwhile, in California the freeway honeymoon was shorter than is commonly thought and certainly not as long as it has been in Texas. 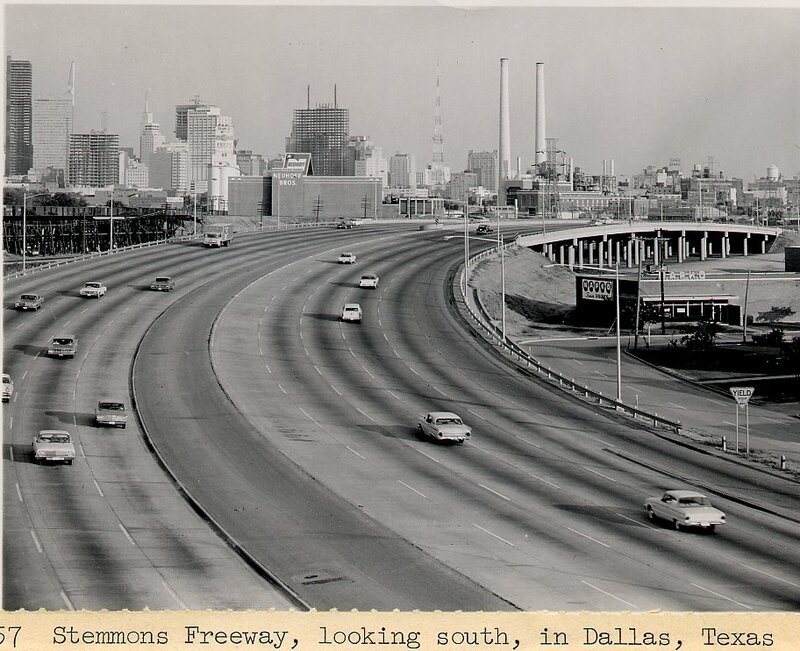 I-10 west of Houston is said to be the first freeway in the US to have had ten lanes as the original construction. 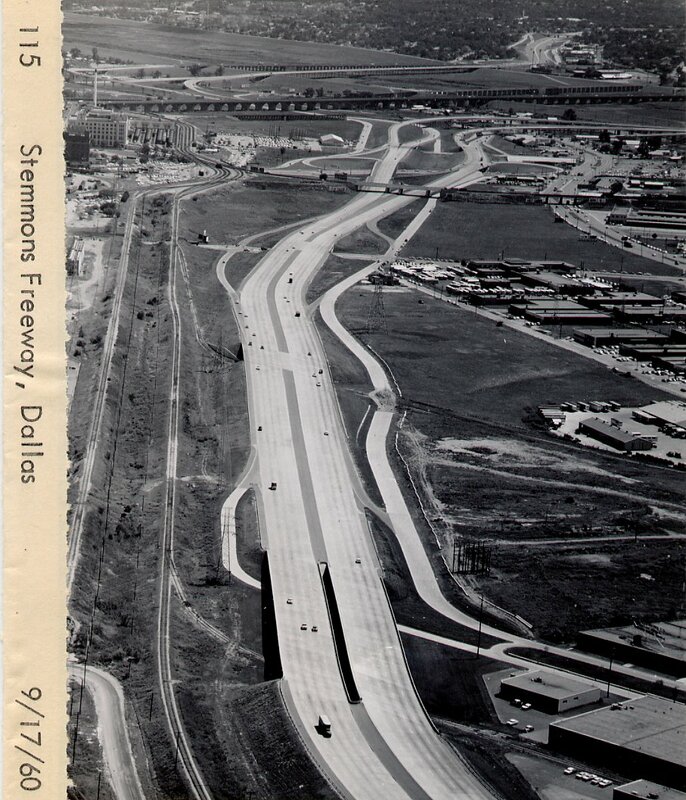 Yeah I know Stemmons (35E) had 10 lanes originally... 35E opened its first stretch in Dallas 8/3/59. The Katy Freeway opened in 1962 AFAIK. It seems like something in New Jersey or California would have had 10 lanes before either of those, however. how many lanes did 405 open with near LAX? Today it's got 5 each way in various locations. The 10-lane claim comes from my recollection of Erik Slotboom's Houston Freeways, and may be misremembered--it could be first 10-lane freeway in Houston, or in a previously undeveloped rural area. I will try to check. Re. New Jersey and California, my understanding is that the NJTP was built in 1950-52 without the dual-dual configuration, which was added during a widening in the mid-1960's, and my review of the scanned aperture cards in LA City's Engineering Vault suggests that freeways (in LA at least) were built with six to eight lanes originally in the late 1940's and through the 1950's, with a fifth lane in each direction being added through later widenings or shoulder-to-lane conversions. I've read somewhere cheap labor in Texas also has to do with it. If that's true, I can understand it, stacks are the most efficient interchange form, and Texas seems to want them badly. I compared some Texas stacks to Dutch cloverleafs (with Distributor/Collector lanes), and stacks do not necessarily take more land space than our cloverleafs, although they do require more bridges ofcourse. For instance this cloverleaf covers 1850 feet across, and this stack covers about 1540 feet (including frontage roads), measured between the outermost connector lanes. I am not so sure that low labor costs are a factor. It costs approximately the same ($250 million) to build a stack in Texas as in, say, Arizona. But it is certainly true that seismicity is not as critical a consideration in places like Texas, Arizona, Ohio, and Michigan (all of which have stacks) as it is in California. I believe that number is now closer to 40 stacks (full and partial) in Texas with many more on the way, especially in San Antonio. Believe it or not, TXDOT actually dismantled two stacks in Houston, I-10/I-610 and I-10/B8 and replaced them with newer ones to incorporate the Katy Freeway expansion. That might be the only times ever where a stack was torn down due to inadequacy. The original stack, I-10 West Freeway at Beltway 8, was built around 1990 and lasted until 2004. Wow, for a stack, what a short lifespan. (Actually, as you mentioned, I don't even know if a stack has ever been torn down before). Though the vast majority of BW-8 and I-10 was torn down and rebuilt, some of the new ramps were connected to the older existing ramps the connect to BW-8. Also, the bridge that carries BW-8's main lanes is still the original bridge from the 1990-era interchange... I sometimes think it's funny how Texas tears down stacks bigger that most states are putting up. In response to cloverleafs in Texas, when Westpark Tollway was constructed, they had to incorporate cloverleafs in some of the interchanges due to a limited amounts of space. oh yeah and theres a full cloverleaf in San Antonio, theres a few cloverleafs in Abilene, i saw a old cloverleaf in Lubbock last time i was there. I'm in San Antonio right now and all I have to say is that I-10 and Loop 1604 on the west side is in desperate need of replacement. Traffic is pretty bad there. The original I-10/B8 West Freeway interchange lasted just over a decade, but the original I-10/I-610 West stack was built in 1968....both were dismantled in 2004 to make way for their bigger and more modern replacements. Two more stacks are on the hit list: the US 290/B8 interchange also built around 1990, is planned to eventually be dismantled and rebuild a bigger stack in it place to accommodate the long-anticipated expansion of US 290. And long-range plans also call for the current I-45/I-610 stack to be eventually dismantled and replaced with a bigger more modern one; the current one is constantly overloaded, especially during the morning rush hours. So even some of the old stack interchanges, one by one, across Houston are being torn down and replaced, just as one by one they are taking out the cloverleaf interchanges. I still think U.S. 59 (Southwest Freeway) and I-610 is in need of replacement. Even though if it did see some improvements with the 610 widening. Pretty much all the stacks along I-610 are old and inadequate. Even the newest of the original I-610 stacks was opened in 1979. Also, you'd be very hard-pressed to find left-lane exits in Houston anymore, as the city has been getting rid of those as well. There are still a few of those in downtown.